Bonnet | "To write is to become." 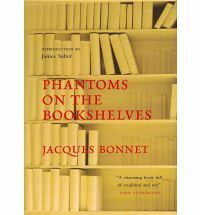 Jacques Bonnet lives up to his reputation as novelist, translator and a manic bibliophile through his book Phantoms on the Bookshelves. Originally written in French, this book expands the tale of one bibliophile to many others, allowing the readers hearty peeks into their bookshelves, their patterns and habits of collecting, buying and selling, and obtaining books as well as the art of reading them. Reading in this book takes the very act into a different level, the jouissance inherit in reading itself. No longer is the term reading self-evident; rather it is orgasmic, addictive. It is a life and a career of its own, it is writing and breathing and living. And I relate. Bonnet satiates the thirst of literature and book lovers through valuable literary anecdotes. His accounts are both informative and charming (if you are a book lover, expect a few Goosebump-y episodes every now and then). Bonnet tells it all: from organizing your bookshelves and creating an exclusive system, to the difference between real/fiction characters and the author, to the tales and habits of reading, writing, record-keeping and library collections. The book is an easy, fast and enjoyable read of 123 pages distributed among 9 chapters. Bonnet tells us that reading is a conversation with the past, a walk down a Borges-ian labyrinth or a Zafon-ian cemetery of forgotten books. It is a lively experience, a meeting with the dead and the great, (not in such a disturbing manner as this sentence conveys). Bonnet’s Phantoms of the Bookshelves also credits the genius of great writers, collectors and thinkers, while all the while, intentionally or not, sharing valuable titles and recommendations. After 123 pages, I came to be reminded of another similar and valuable book about books, reading, collecting and the internet age by Umberto Eco and Jean-Claude Carriere, This is not the End of the Book; is a conversation curated by Jean-Philippe De Tonnac. Both books are a must on every bookshelf.